[PDF] Russian Case Morphology and the Syntactic Categories (Linguistic Inquiry Monographs) [Russian] | Free eBooks Download - EBOOKEE! Posted on 2017-12-20, by luongquocchinh. Description: In this book, David Pesetsky argues that the peculiarities of Russian nominal phrases provide significant clues concerning the syntactic side of morphological case. Pesetsky argues against the traditional view that case categories such as nominative or genitive have a special status in the grammar of human languages. Supporting his argument with a detailed analysis of a complex array of morpho-syntactic phenomena in the Russian noun phrase (with brief excursions to other languages), he proposes instead that the case categories are just part-of-speech features copied as morphology from head to dependent as syntactic structure is built. Pesetsky presents a careful investigation of one of the thorniest topics in Russian grammar, the morpho-syntax of noun phrases with numerals (including those traditionally called the paucals). He argues that these bewilderingly complex facts can be explained if case categories are viewed simply as parts of speech, assigned as morphology. 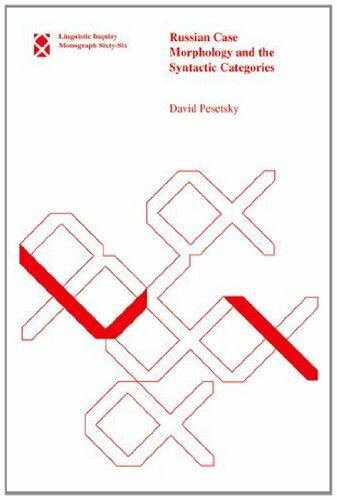 Pesetsky's analysis is notable for offering a new theoretical perspective on some of the most puzzling areas of Russian grammar, a highly original account of nominal case that significantly affects our understanding of an important property of language. No comments for "[PDF] Russian Case Morphology and the Syntactic Categories (Linguistic Inquiry Monographs) [Russian]".